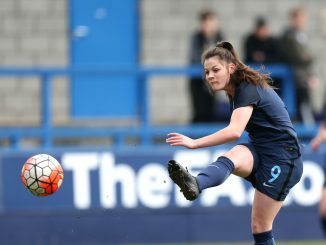 The UEFA Women’s U-19 Elite Round qualifiers commenced on Wednesday 3 April and featured a big win for England, while Northern Ireland lost to Norway but Republic of Ireland beat Hungary. England blew away Turkey with four goals in a 16-minute first-half spell at St George’s Park. Ebony Salmon, Lucy Fitzgerald and Emily Syme each bagged a brace, with Lauren Hemp also on target. The Young Lionesses play their next Group 6 game on Saturday against Sweden, who lost 1-0 to Italy and a Sara Baldi goal. Northern Ireland lost out 2-1 to Norway in Group 5, My Sørsdahl Haugland and Jenny Kristine Røsholm Olsen finding the net before Alexandra Colligan replied on 78 minutes. The Irish next play Denmark, who were three goals to the good in 19 minutes on the way to a 6-0 defeat of Ukraine in which Janni Thomsen scored twice. Heather Payne added a second-half goal to a first-half penalty as Republic of Ireland beat Hungary 3-0. Substitute Carla McManus netted in the last minute and the Hungarians earlier conceded an own-goal. Next up for Ireland in Group 4 is Serbia, beaten 2-0 by a six-minute brace from Spain’s Eva Navarro. Greece held out for over half an hour against Germany but still conceded twice in each half in a 4-0 Group 1 loss. Czech Republic scored twice in the last quarter of the match in defeating Austria 2-0. Belgium beat Switzerland 2-0 in Group 2 with efforts by Aster Janssens and Lisa Petry, while Finland edged Poland as Dana Leskinen got the only goal 11 minutes from time. Russia twice lead through Viktoriya Dergousova but Iceland hit back each time to earn a 2-2 tie in Group 3. All Netherlands’ six goals against Bulgaria came before the break, with Romée Leuchter twice on target. In Group 7, Slovenia saw off Slovakia 3-0 with a trio of late goals after their goalkeeper, Zala Meršnik, remarkably saved two penalties in as many minutes early in the second period. 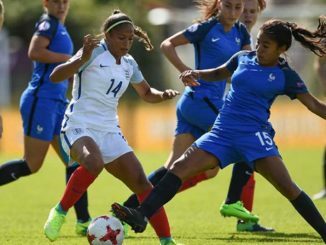 France put six past Portugal with Melvine Malard getting their first two goals. 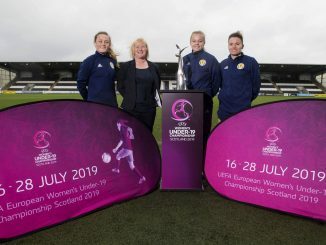 The seven group winners join hosts Scotland in the finals from 16 to 28 July.